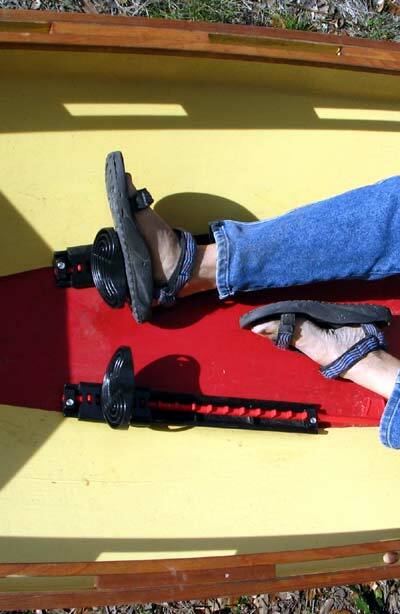 These are absolutely the best kayak footbraces we have ever seen. They are resistant to any of the things you might run into including water, sand, fish scales, sunlight - nothing will stop these footbraces from working properly. The pedal is molded out of prime Nylon and is easy to adjust from the cockpit. 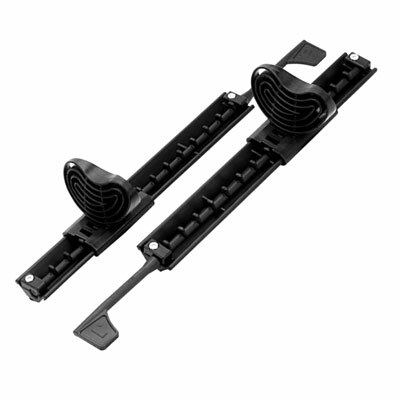 The track, the adjustment rod, and the mounting clamps are molded out of engineered Polypropylene, and shaped for tremendous strength and uncompromising stiffness. The stainless steel mounting hardware is designed to retrofit most existing foot brace systems - hole spacing is 14-1/2 inches. 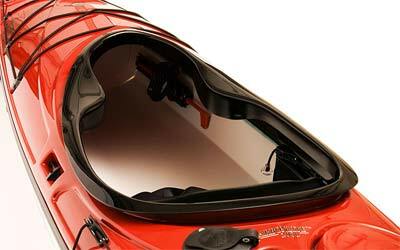 Easily installed in any plywood kayak or double paddle canoe. The adjusting mechanism is engineered to be maintenance free, self-cleaning and corrosion resistant. 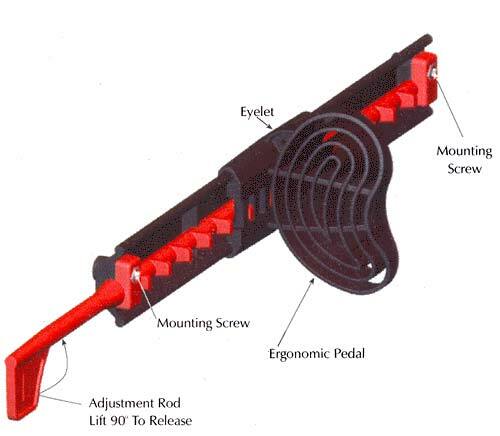 Easily adaptable to a rudder control system by removing the adjustment rods and connecting a cable or rope to the molded-in eyelets located on each foot pedal. The ergonomically designed pedal makes it very comfortable even with bare feet. Our new foot brace has 14" of adjustable travel in 1/2" increments with a turn of the lever. Take out the rod, connect a cable or a rope to the eyelet on the pedal, and the foot brace becomes a foot operated control system for your rudder. 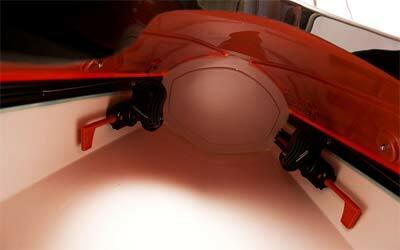 You will need to measure the foot braces to ascertain the distance between the thru hull mounts. Drill two --¼” holes for each foot brace to fit the screws provided with the foot braces. There are plastic washers included, so you only need to drill holes, set the braces in place and tighten the nuts. As for placement, that will be determined by the individual boat—how much space you have for installation, whether you want the braces up on the inside sides or father down. Set them inside the boat and get inside, and just see what you think. 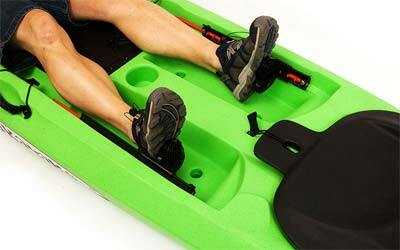 You will need to be able to reach the adjustment lever with some degree of ease while paddling in case you want more or less knee room. NOTE: There is a left and a right footbrace - they are marked with "L" and "R" on the adjustment rod lever. These instruction will also work for wooden boats if you decide on thru hull, but we recommend using the glue on stud mount for wooden boats. No holes to seel! 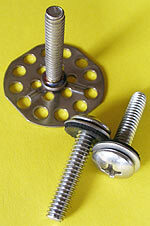 You have the option of two types of mounting studs: through mount or glue-on studs. The glue-on type is shown on the top at left and is best for wooden boats or any that can be effectively glued to. You can easily bend the flange to fit the curve of the hull. Through mount type comes with a 1/4-20 bolt (wide, low profile head with washer and gasket) which goes through the hull of the boat to secure the footbraces. These are best for plastic boats that cannot be glued to or if you would rather drill a mounting hole than glue on a stud. 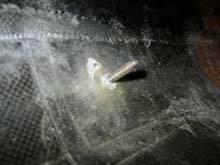 Occasionally, a longer bolt will be required for a boat with a thicker skin. These are easly found at any hardware store. If your boat already has 1/4" studs on 14-1/2" centers for standard foot rest mounting, order the through stud option as it comes with the right parts for this type of mount. If you are not sure which type of stud to order, choose the through mount and order the glue-on stud mount kit. That way you can use either method. Read David Nichols article on installing our kayak footbraces in a wood boat using glue-on studs. Subject: Re: Thank you for your Duckwork's order! Received the foot braces Thursday of last week while I was away at an instructor udpate course. I installed them this morning in my Mainstream Patriot to replace the original equipment ones. I like the way the adjustment works on yours way better and I love the bigger foot rest. The second pair was for the Mainstream Riptide I just bought for my wife, that did not have foot braces. Now we can both use her boat without problems, as I am 5'9"+ or - and she is 5'0- on her tallest days. I know that you're probably swamped in emails, but I wanted to thank you for the quick service and great product. I had the replacement footbraces on my kayak in no time and couldn't be happier with them. I look forward to getting more boat "stuff" from you in the future. I ordered two sets of footbraces for my kayaks, but after trying to fit them, I found the holes didn't match up. Mine are just over 14-1/2 inches apart on both boats (different manufacturers). I hated to give up on the braces because they looked like they would be wonderful on my feet and to adjust. I was afraid I was going to have to return them, but I ended up using a dremel and enlarged both brace holes toward the ends, and they fit perfectly. Just thought I would let you know in case someone else has the same problem sometime. If you build your kayaks like me - the boat is advertised to come in at 42 lbs, but like me, you bring it in at 48 lbs., you may encounter the problem that I had with the really nice Duckworks foot braces. I tend to use a little more glass, and a little more epoxy putty because I want my boats to really stay together. In this case its the really nice stainless foot brace studs that get epoxied to the hull (leaving a clean exterior on the hull - no screws on the out side of the hull). I covered my stud flanges with 6 layers of glass and a little mountain of putty. See the photo below. Well that mountain of putty and glass shortened the length of my mounting stud by 1/4". To my regret it left the studs too short for the Duckworks foot brace rails to be mounted. I thought there was no solution but to buy another manufacturer's foot braces. A view from the back of the brace rail. 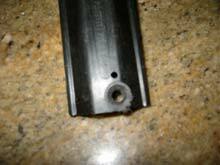 I sawed off the 1/8" flange on the brace that surrounds the hole and then i countersunk the hole. I also enlarged the hole to 9/32" so the rail can be easily slid on and off the studs as opposed to fighting to get them on and off. In my attemp to solve the problem I first removed the tiny 1/8" flange cast into the brace rail. it was not enough - oh well buy another type of brace. The next day it came to me - I have what looks like a little mountain peak shaped like a volcano of putty eating up that precious 1/4" of stud. There is a solution - countersink the holes for the mounting studs on the back of the brace. See the photo below. So if your tend to work like me there is a solution OR .... just don't go nuts with all that epoxy putty. Its not really necessary.